The Cajun Courir de Mardi Gras is a unique experience steeped in tradition and culture, a celebration both choreographed and primal in its expression. Costumed revelers travel through the countryside to “beg” for gumbo ingredients, mock the rich and privileged and celebrate with a communal meal. Mémoire de la Boue – The memory of the mud. Ancestral, genetic or inherited memory. 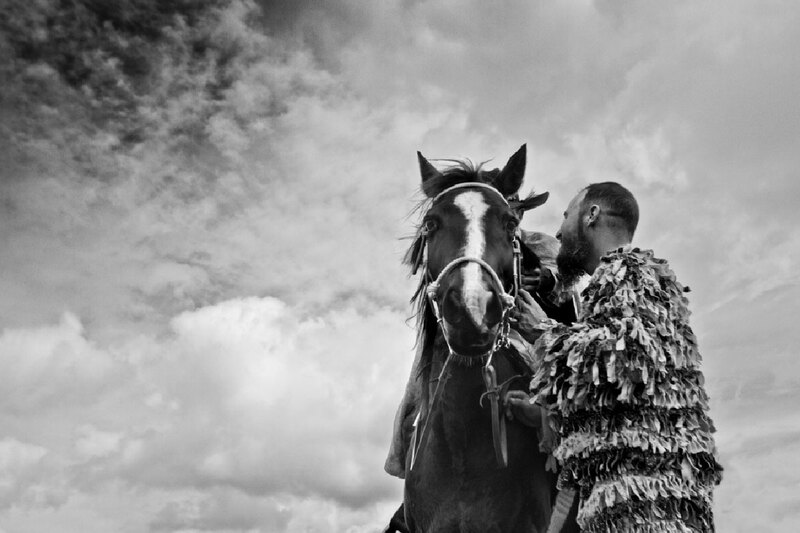 For photographer Lucius Fontenot, capturing the always colorful Courir in stark black and white was a revelation. The once-familiar scenes suddenly seemed alien, surreal. He was able to see the culture and tradition at work with new insight — able to appreciate its strange beauty in an entirely new way. His work is a reminder to us all of the importance of not just looking, but truly seeing the magic and mayhem that is all around us. Lucius Fontenot is a Lafayette-based photographer whose work focuses on the cultures, traditions, foodways, ephemera, people and geography of South Louisiana. His work has been exhibited in Louisiana, Canada and France and in publications such as Guitar Player Magazine, Wonder South, Southern Glossary and Vice.com. He was recently awarded the Frank Relle Gallery/NOPA Scholarship, Windgate Scholarship at Penland School of Crafts in Penland and the 2018 Art Spark Grant. Lucius is also a contributing photographer to Jolie Meaux’s Porch, Wine and Gravy, a Cajun food blog recently featured on Anthony Bourdain’s show, “Parts Unknown,” on CNN. The Capitaine (Captain) is the leader of the Cajun Mardi Gras. The costumes of the Courir are designed to mock the aristocracy, scholars and church—a tradition dating back to medieval France. The Capitaine has a group of enforcers, or Co-Capitaines, who regulate the Courir. They are also symbols of authority to rebel against. The Courir de Mardi Gras takes place in the countryside of Acadiana. Animal costumes are commonly worn by Courir participants. Horses have always been important to Cajun culture and its traditions. A chicken is placed atop a tall greased pole and revelers must work together to free it. The Mardi Gras group goes house to house “begging” for ingredients to make a communal gumbo at the end of the day. Rice, sausage, and vegetables are freely given, but chickens are live and must first be caught. Tools of the boucherie trade. A traditional Cajun boucherie is a communal slaughtering of a hog and production of boudin, cracklins, andouille sausage, hogshead cheese, backbone stew and more. Every scrap of the animal is typically used: ears, snout, brains, feet and all. Literally translated as “pig in milk,” a Cochon de Lait is the traditional Cajun slow roasting of a whole young pig, usually for 6-12 hours. All photos provided by Lucius Fontenot. The only thing better than chocolate is better chocolate. Carol Morse shares her process for crafting a perfectly flavored bar.